Tagline- Poison, Drowning, Claw or Knife. So Many Ways to Take a Life. Trick ‘r Treat had an original release date of October of 2007, but Warner Brothers decided to pull it and no real reason was given, but perhaps it had to do with the release of Saw IV, since at the time the Saw franchise had a strangle hold on October. After that Trick ‘r Treat sort of sat in limbo and just shelved and sort of forgotten about by WB. Finally after 2-years Trick ‘r Treat was finally released DTV (it did have showings at festivals prior to the DTV release). Trick ‘r Treat while in limbo sort of built up a cult following and the legend grew a little more after festival showings and the DTV release. Trick ‘r Treat was instantly praised as a classic of the genre. 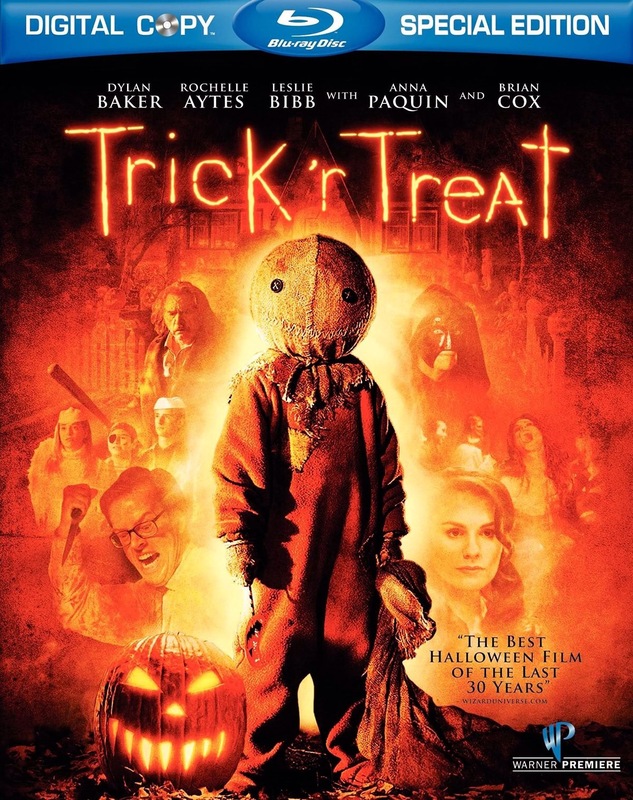 Every review I came across was almost always glowing and some people have even listed it as one of their 10 favorite horror films.Trick ‘r Treat is a good movie, but the fact the studio kind of jerked it around and the legend grew I cannot help but feel its been generally overhyped. I did find the movie to be entertaining, but I have to question anyone who lists this in a top 10; to hold this movie in as high regard as such classics like Halloween, Bride of Frankenstein and Night of the Living Dead is a bit much. As I stated with the Saw franchise dominating October that could have been a reason for Trick ‘r Treat to be shelved, but another reason could be horror anthologies, which used to be very popular weren’t by this point. Even in the 80s the popularity was fading with really the main exceptions being the Creepshow movies. However with that said I’m not totally sure Trick ‘r Treat is an anthology. The basic structure of the plot is sort of a horror version of Pulp Fiction since it has multiple stories inter-cut between each other and they all in some way link into one another and the timeline sometimes jumps around to different times within the night. While the basic concept is something you’d see in an anthology it doesn’t really unfold like that with when one story ends another begins. I have no problems with this being listed as an anthology since I might put it within that style as well, but its debatable since if Pulp Fiction isn’t an anthology perhaps Trick ‘r Treat shouldn’t be listed as one either. On Halloween night a principal moonlights as a serial killer and kids seek out an urban legend are among just a couple of the stories. 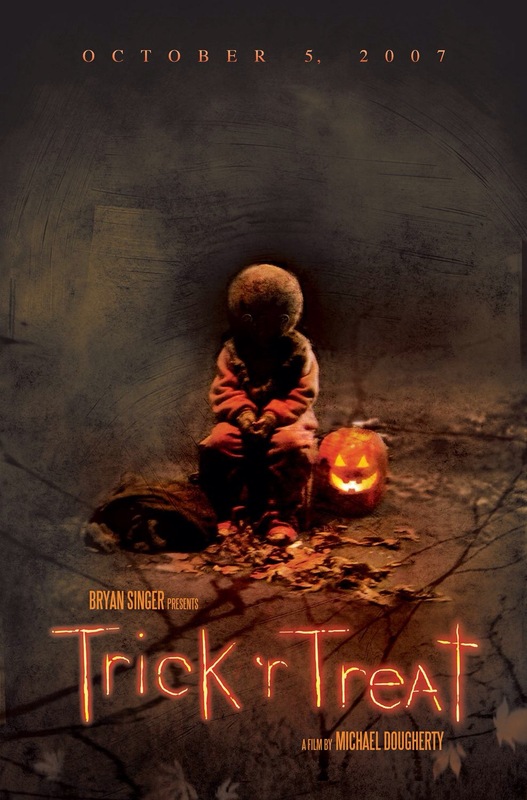 Trick ‘r Treat was written by Michael Dougherty who also co-wrote such films as X2 and Superman Returns. The script by Dougherty is highly entertaining and fun. The film is well plotted with some nice twists and the characters are all quite fun and while they aren’t deeply developed they all add to the story and seeing as no character really carries the film there isn’t any issues. While the horror genre isn’t always noted for its writing, Michael Dougherty delivers a very solid and well written script that at times plays up to the mythology of Halloween. Trick ‘r Treat marked the feature film directorial debut by Michael Dougherty and he delivers a well made and generally well paced film. Of all the films I’ve seen set on or around Halloween, Trick ‘r Treat is no doubt one of the very best in terms of capturing the essence of the day. John Carpenter’s Halloween is in my opinion one of the greats and it does capture the fall setting excellently, but to me it could have been set anytime in the fall. While Halloween 4 wasn’t nearly as good as the original, but I’d say that was the best in the series in regards to capturing the Halloween feel and not just the series, but any Halloween themed film and I’d rate Trick ‘r Treat a very close 2nd. From the start Dougherty captures a fun tone with a little something sinister lurking underneath. The pacing is generally strong, but in my opinion the pace can drag in spots during the 2nd half. Trick ‘r Treat is light on suspense with a couple of exceptions, but I’m not really sure the intentions were to make a film with suspense and tension. What Michael Dougherty does very well is simply craft a fun film and while I did feel to some degree the 2nd half wasn’t quite as strong its still effective and fun. Trick ‘r Treat has a terrific cast, which in part help elevate the film and with a fun script and strong directing Trick ‘r Treat is essential viewing in October and along with Halloween 4 perhaps the best Halloween themed film (but neither are the best Halloween film). Quite honestly I wouldn’t rate this as highly as some do, but its an effective and fun film.